Molotow chisel tip marker 4/8 mm. Molotow one4all marker 15 mm. Molotow pump marker 1 mm. Molotow pump marker 1.5 mm. 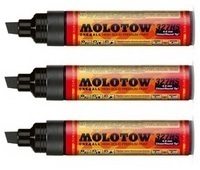 Molotow pump marker 2 mm. molotow pump marker 4 mm.